If history has taught us anything, besides to steer clear of garlic nibbles on a first date, it’s that bundled software possesses the ability to make or break a new bit of kit. Nintendo, of course, knows this better than anyone, and there’s no denying that it was the inclusion of Wii Sports; a short and snappy demonstration of the Wii Remote’s capabilities; that was responsible for the initial success of its motion-sensitive console. Fast forward to 2010, and the Wii Remote Plus (a remote that allows for perfect, 1:1 calibration thanks to built-in MotionPlus technology) has arrived, and, following the relative failure of Red Steel 2, Nintendo needed a killer app’ to bundle it with. Quite why it’s enlisted the help of FlingSmash, then, is a mystery, as it does little to showcase the talents, nor the potential, of this new and exciting tech’. That’s not to hate on FlingSmash, though. While the game never quite manages to demonstrate the true potential of Wii MotionPlus, FlingSmash is a delightful, refreshing, and decidedly old-school title that should have arms a-wavin’ this Christmas – if only for the game’s relatively short, three hour duration. You play as either Zip or Pip, the spherical heroes tasked with liberating Suthon Island from the malevolent grasp of Omminus, who has blighted the tropical landscape by showering it with large, colourful blocks. Fortunately, Zip has been locked away in a box since the last time this happened, and it’s up to you to use him to smash all the blocks and retrieve all the sacred pearls with which to protect the island’s Great Palm Tree. Navigating Pip throughout the game’s colourful stages is ostensibly a matter of flicking the remote in the desired direction. The Remote’s orientation is displayed at the bottom left of the screen screen, and it responds flawlessly to every last flick of the wrist. Problem is, without any kind of virtual bat or marker to gauge shots, Pip doesn’t. The game attempts to guess the moment at which you make contact with Pip, and it’s as erratic and inconsistent as it sounds. Instead, you’re forced to resort to angular swipes of the arm, which seems to fare a little better. FlingSmash’s control scheme isn’t too much of a problem during the game’s introductory levels, however. Kicking things off on the appropriately-titled Biginnah Island, FlingSmash requires you to collect three of five hidden coins in order to nab the sacred pearl at the end of each stage. Coins tend to lie behind various blocks (the trick being to to grab them all before the level scrolls too far afield), whereas others can be found far from the beaten path, and some are carried by enemies or even Omminous himself. Run into Omminous during one of his brief cameos, and you’ll be transported to the ‘dark space’, where you’ll have to complete a specific challenge to earn a coin. Challenges vary, but usually ask that you to defeat enemies against the clock, or batter a number of markers in quick succession. 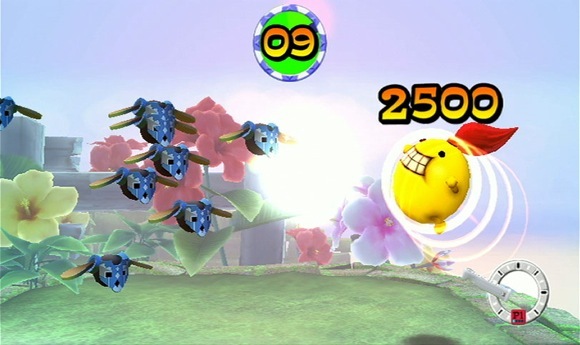 Numbered blocks need to be hit several times before they’ll reward Pip with a coin, moving position with every successful hit; keys can be used to unlock several branching paths, and power-ups – triggered by collecting three of the same fruit – can be used to increase Pip’s size, boost his shot-power, or split him into three for an injection of power and points. A score-attack game at heart, switches possess the ability to transform blocks into diamonds for extra points, whereas collecting 100 stars will earn you an extra life. Points gleaned throughout the level will also affect your overall level ranking. While it’s impossible to achieve anything less than a B, achieving the game’s elusive S ranking is an incredibly exacting task, and one that requires more luck than it does precision. 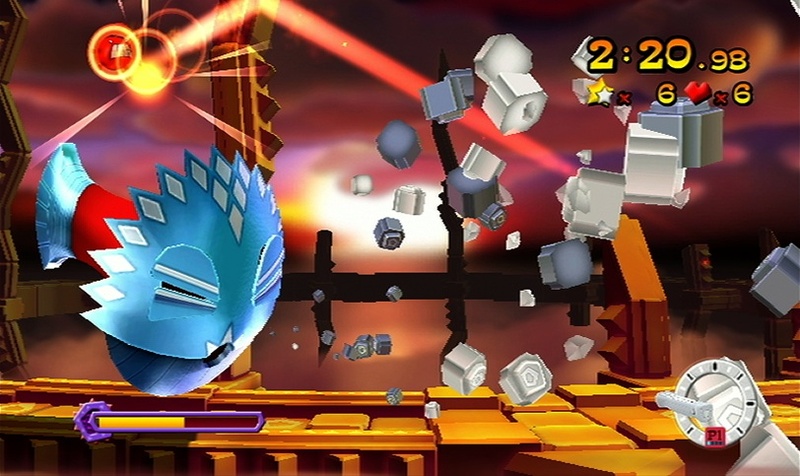 More forgiving, however, are the five end-of-level barriers, which require you to smash through the moving red sections of them all for an additional score bonus. Ultimately, it’s the limited nature of FlingSmash’s concept that fails to keep bums on seats here, but Artoon has at least attempted to add variety to the proceedings – often by playing around with the elements. One world, for example, has you guiding a metallic Zip that requires you to use magnets effectively to make your way through the level, whereas another takes place underwater with viscious, serpentine creatures. Later levels even shrink Pip to half his original size, rendering it impossible to break certain blocks, or even use super-shots (powerful attacks, triggered by charging up regular shots). Vertically-scrolling stages, meanwhile, spice up the proceedings even more, with fierce dragons snapping at your heels should you linger at the bottom half of the screen too long as you line up shots. It’s the game’s end-of-level bosses, however, that impress most – forcing you to use every skill you’ve learned throughout the game. Whether you’re using super-shots to break through defences, targeting an enemy’s weak spot with an accurate flick of the wrist, or memorising enemy patterns and acting appropriately, boss encounters go some way to break up the monotony of the main game. And that’s just problem with FlingSmash: it’s great fun at times, but there’s no denying its concept is simply far too limited to warrant repeated play. With poorly implemented controls, FlingSmash fails as both a score-attack game, and as a representation of Wii Motion Plus. If you simply must have Wii Motion Plus, we’d suggest that you buy it separately. However, if you’ve a couple of young children or non-gamers living in your household, FlingSmash is likely to go down a treat. Everyone else, though, would do best to avoid it like the plague. Or garlic nibbles.